Large work window, 72”W x 96”L x 40”H, that accommodates diverse sizes and geometries. Inverted power & free conveyor system for top coat painting designed and engineered by ABB. Fully automated stainless steel piggable paint circulation systems. Stainless steel 6-stage power wash system. Six-Axes Fanuc robots equipped with Integral Pump Control (IPC) employing Sames Electrostatic Multi-Spray Bell/Gun applicators. 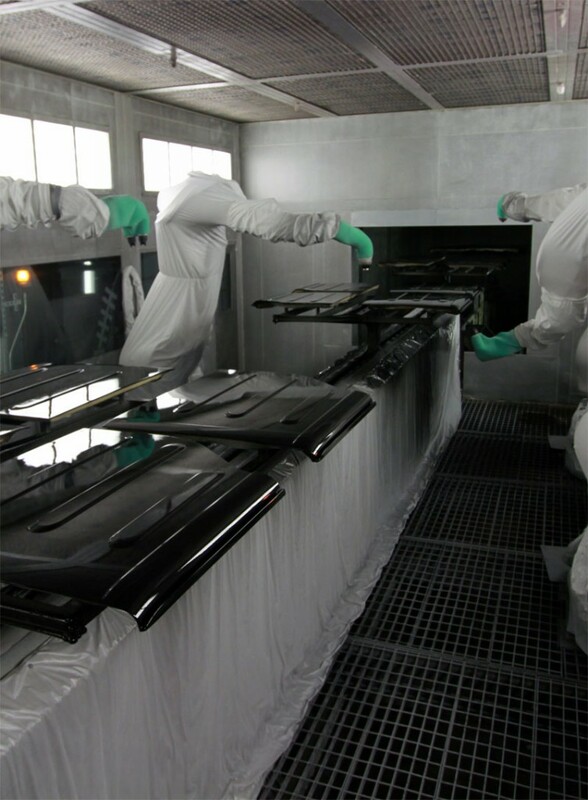 One and two-component, solvent borne wet coat application with cure capability at high or low-bake temperatures. St. Claire paint fluid temperature control units. Certified laboratory and defect analysis equipment. © Creative Liquid Coatings, Inc.